Launchy and GNOME Do are both two launcher programs that are designed to let you quickly open applications and files and perform tasks you want done quickly, with just the tapping of a few keys. Previously, Launchy had been an open source solution, albeit for Windows only, and GNOME Do was the Linux solution. Launchy is now available for Linux too, so I thought I would do a brief side-by-side compare of the two programs. GNOME Do has the advantage of being a well-established program on the Linux platform, and you'll probably be able to find it in your software repositories with no problems for the easiest installation route. At the current time, I don't think Launchy is in any standard software repositories for any of the major distributions. Debian and Ubuntu users can grab a .deb for relatively simple installation, but otherwise, it's from source. Installing from source isn't all that difficult, though, if you've done it before, it is just an extra step. Interface-wise, the two programs are pretty similar, but there are some subtle differences in the interface. Our resident GNOME flavoured launcher shows up an attractive interface by default when you press the hot-key and start typing what you want to do. 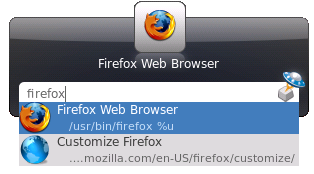 For example, here I can type Firefox. 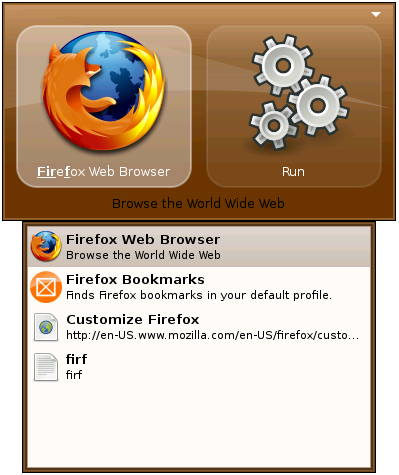 By default, the action is to launch the Firefox browser, but I can press down to see other possible actions based on my search. It is a good interface that is functional and simple whilst still being attractive. Notice also that it integrates well with the Ubuntu look-and-feel (but on my Fedora system shows up in blue to match that theme). Launchy's interface is similar, going for a black theme by default (different themes are configurable via a right-click), once you press the hotkey. Rather than simply highlighting the letters you are typing as they appear in the result, like GNOME Do, Launchy gives you a full text field so you can see your query more clearly. Results then drop down from that. In some ways, I think I mildly prefer Launchy's way of doing things in terms of the interface, but I think it ultimately comes down to personal preference which method you will prefer (especially if you are already accustomed to one interface). Launching applications is all well and good, but Alt-F2 can do that pretty well, if you know the name of the command you want to run. Where these applications really come into their own is when you add plugins to them so they are capable of doing other things - launching websites from bookmarks and integrating with other programs on your desktop. GNOME Do has an impressive array of different plugins offering application integration and unique functionality. A whole section is dedicated to them on the wiki. Of course, many of the plugins listed there ship with the standard package, so you won't have to do anything to be able to make use of the extra functionality they provide. Launchy doesn't have quite the same volume of plugins as GNOME Do, at least not on the Linux platform at the current time. Nevertheless, it does do a good job with what it has, and didn't need a special plugin to read in my Firefox bookmarks, for example. 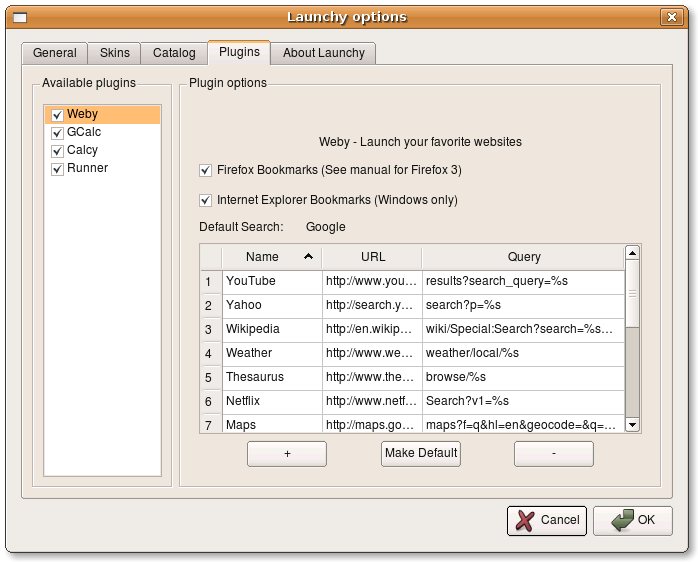 Whether you find the lack of plugins right now a limitation will depend on how you use your launcher and what third-party programs you use - Launchy may well easily be able to offer what you need it to do. However, GNOME Do does appear to be the leader in this department right now. You could argue that this category isn't going to be fair to Launchy - that doesn't have a specific focus on one desktop environment. Nevertheless, how well a launcher integrates with the rest of the environment you work in is pretty important. The clue is in the title. GNOME Do is straight-up written for excellent integration into the GNOME desktop environment and a GNOME-based workflow. It runs perfectly fine elsewhere, of course, but the emphasis really is on making it a GNOME desktop launcher. To that end, it integrates well with your theme, including your GNOME icon set and colours. The rich set of plugins for GNOME applications also mean that you will be able to achieve more than just starting programs. Having been around for much longer on Linux, GNOME Do again appears to have the edge. Launchy, unlike GNOME Do, is written using the Qt toolkit (which underlies KDE). It is not a KDE application, however, but neither is it a native GTK application (GTK underlies GNOME, Xfce etc.). This means that on GNOME, the interface is likely to feel more out-of-place. This is especially noticeable in the Options dialogue, where the Qt-ness stands out from other GTK applications. On a KDE system, this will be much less of an issue as it will look more integrated, but there is not a specific focus on making Launchy a launcher 'for KDE'. One positive aspect of Launchy, however, is its support for Themes. The main Launchy window that appears on pressing the hotkey can be set up to use any one of several 'skins' and I'm sure third party skins can be created too. This means that it might be possible to make Launchy feel well integrated into a much wider range of different desktop environments, with full customisation possible. There isn't an awful lot to choose between these two programs. They both generally do the job and they both do it well. If you are a GNOME user and use a lot of applications where GNOME Do has plugins available, I'd recommend sticking with GNOME Do for now. It's worth watching the Launchy on Linux effort to watch new developments, of course, but for the time being, GNOME Do appears just about ahead. KDE users, or users of other DEs might want to try Launchy as an alternative, especially if you're used to Launchy over on Windows. Its skinnability and possibility for future plugin development mean that there could be a lot more great things to come. (KDE users should also evaluate Katapult, for a native, integrated KDE launcher).